Quite possibly the most beautiful room we have played. Thanks to Meeting House Presents for having us. You can find 'Two' on our second album, "Rise Up." $14 for students with ID. Children under age 12 are free with paying parent. 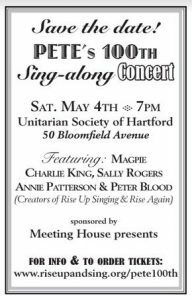 Save the dates for 2019-20 Upcoming Meeting House Presents Concerts (Click on the performer’s name for additional information) Unitarian Society of Hartford, 50 Bloomfield Ave. Hartford, CT.
We don’t take reservations, but advance tickets are available online at Brown Paper Tickets. Information about Brown Paper Tickets. Our email includes concert announcements, updates, and info about folk music events in the area. Subscribe to Meeting House Presents Email send a message to MeetingHousePresents@gmail.com. Put “subscribe” in the subject line. We send one or two emails each month. Pete Seeger was born on May 3rd, 1919. Click for more information about Pete. How can all of us celebrate the 100th anniversary of his birth this coming May? Let’s hold community singalongs and concerts all around this country! Not just to remember Pete and all he gave to the world – but also to rededicate ourselves to working tirelessly for the kind of world he & Toshi believed in so passionately. One of the things Peter and Annie are doing is creating a special little collection of lyrics and chords to 40 of the best songs Pete led audiences in during his concerts. Tentative title is If I Had a Hammer: A Pete Seeger Singalong Songbook. We hope this will be out in March so it can be used at singalong celebrating Pete’s 100th. More information here. 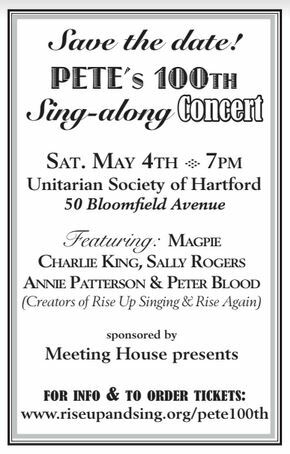 Annie and Peter will lead this commemorative singalong concert in collaboration with songleading musician-activists Charlie King and Sally Rogers. Watch for more details soon at the news and events section of this website. You might know Sally Rogers from NPR’s A Prairie Home Companion with Garrison Keillor. Her repertoire includes traditional, contemporary and original ballads and song, interwoven with stories taken from her life as a performer, a wife and a mother. Throughout her concerts, she accompanies herself on guitar and Appalachian dulcimer, or performs without accompaniment in a voice that needs no further enhancement. Reviewers have described her voice in superlatives ranging from “remarkable” to “mesmerizing.” As one critic summarized, “…it’s really next to impossible to do justice to a voice of that quality.” Much of the material performed by Sally includes compositions of her own, many of which are considered classics of the folk and popular genre. Magpie (Terry Leonino and Greg Artzner), with two strong voices in harmony and superb instrumental arrangements, their sound is powerful and moving. Award-winning recording artists, singers, songwriters, musical historians, playwrights, actors and social activists, Terry and Greg are proud to be, as Pete Seeger said of them, “…more links in the chain”, dedicating their lives and music to leaving this world a better place. Find out about health benefits of singing. Tickets are $20 at the door/$14 for students with ID. Children under age 12 are free with paying parent. 50 Bloomfield Ave. Hartford, CT.
Meeting House Presents uses Brown Paper Tickets for advance ticketing services until noon the day of the show. To purchase tickets to a Meeting House Presents concert, click on “buy tickets” to the event you want to attend. You will be taken to the Brown Paper Tickets website where you can complete your purchase. When your ticket purchase is complete, you may print paper tickets on your own printer. You can also show the confirmation email received from Brown Paper Tickets on your mobile device at the door. Your ticket purchase will appear on your credit card statement as Brown Paper Tickets. Ticket purchases are non-refundable. A small service charge in addition to the ticket price applies to every purchase. A portion of the service charge is used to support arts and cultural organizations throughout the United States. Tickets can also be purchased at the door with cash or check. Please help support the Fern Street Food Pantry.Since 2012 Fern Street Food Pantry has provided hot meals and provisions for local families with food insecurity, including a program that distributes food-filled backpacks to at-risk West Hartford students. Your help is needed. Please bring a non-perishable food item whenever you attend a Sounding Board concert. There will be a collection box at the admissions table. THANKS! The Lodge at Winding Trails, Farmington, CT Jam & Song Swap 2:00-2:45 p.m. Concert begins at 3:00 p.m. on Sundays, dates TBA. Folknotes.org is a comprehensive web site maintained by Brent Hall featuring folk music events in Connecticut and southern New England. Feb. 23 Dennis McCorkle with Idalberto Perdomo, Edilio Bermudex, Desiree Negron-Carrero and Adèle Paxton.